Papillon Bleu UK: Finished at last! and my camera is almost "dead"
Finished at last! and my camera is almost "dead"
My oh my...things have been soooooooooooooooo busy lately that it has taken me months to finish 2 dolls. Yes...2! Anyway, here are some ( absolutely not good at all) photos. 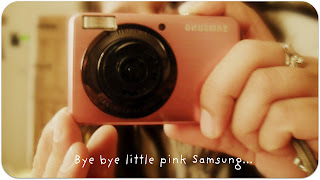 Meanwhile, my camera is slowly saying "goodbye" . Time for a new one? I know it is silly but I really am attached to this little pink camera that I have carried with me for so long. It represents more than a camera. It is the first thing I purchased with my first salary of my first long contract job when I arrived in England. It has accompanied me along my artistic path here on Blogland and it is like a little companion that has witnessed so many moments of my life. Well, time to move on to new things. And many changes are on the way my dear friends. The future will be good.Because this is all I want . A good and happy life. This is what I wish for you too. CARPE DIEM my dear friends. I understand you completetly with the camera. I've been attached to mine for the past four years. I wish you the very best in life, you deserve it and happiness is so important! Elles sont magnifiques toutes les deux!! 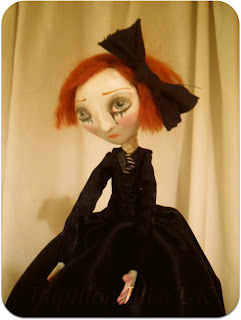 Sweet dolls, Patricia. I've gotten a new camera, and it's a love-hate relationship. I love the idea of what it will (eventually) be able to do, but I hate that the learning curve is so steep, and I'm at the bottom looking up. I just LOVE your work--they are so full of character! Tre belle!! Lovely dolls Patricia. Well all the best for a fruitful and creative year ahead and may it be a very happy one too. Leurs regards sont toujours aussi impressionnants. Magnifique!!! aww~ it's really nice! 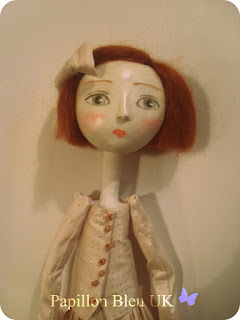 i hope i could make my illustration alive into a doll like urs~! but still learning! =) thx for sharing. Super! J'adore la 2ème. Je suis triste pour ton appareil photo qui était si mignon. Je suis contente de te voir avec autant de bonnes vibrations avec beaucoup d'espoir. How about honoring the little pink camera with a photo of it? The little thing has worked so hard for you that I think it needs its own memorial. Maybe you could take a photo of it in a mirror while it is still with you? It may have taken a while but you've created two wonderful dolls. The first one, I think, is especially beautiful. Maybe you can get a new camera but keep the old one just in case? Or for times you don't want to use a brand new one? Ça fait si longtemps qu'on visite, l'une à l'autre! THANK YOU MY DEAR for visiting me yesterday! This place is as magical as I remember it and thank you for your uplifting message to me. YOU TOO left a safe job? I just did too. I am fortunate that speaking French allowed me immediately to be signed up as a French speaking substitute teacher in September in our school district. I am leaving behind all the paper work and administrative duties for 52 children. Teaching was a wonderful job for me, but it has gotten to be too much, so I am going to stretch myself and my imagination by creating my art AND WRITING. Risky, I know. But YOU KNOW the risks as well, the disappointments and joys. Somehow I think however, that the joy outweighs the pain in the END. I do realize as well that when the bills need to get paid, then doubts come in!!! We shall see. For now however, let us rejoice and sing OH HAPPY DAY!!!!! Your dolls are soooo precious!!! I always love coming to your blog to see your new 'pretties'! What wonderful dolls! Love them! The dolls are beautiful!!! oh I'm so attached to my camera, I don't know what I'd do without it. It's 5yrs old and I'm still in love with it. I love your pink! Much love and happiness to you my dear friend.